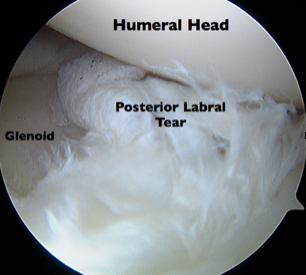 Labral Tears of the Shoulder - Anatomy and Causes (Video) - Jeffrey H. Berg, M.D. Labral tears of the shoulder are a common cause of shoulder pain, instability and sometimes catching or clicking. Over the last 30 years, as arthroscopy and the use of MRI imaging has advanced, the ability to diagnose labral tears as a cause of shoulder symptoms has improved. The shoulder is primarily a ball and socket joint made up of the humerus (ball) and the glenoid (socket). In the healthy state, the humerus sits on the glenoid similar to the way a golfball rests on a tee. 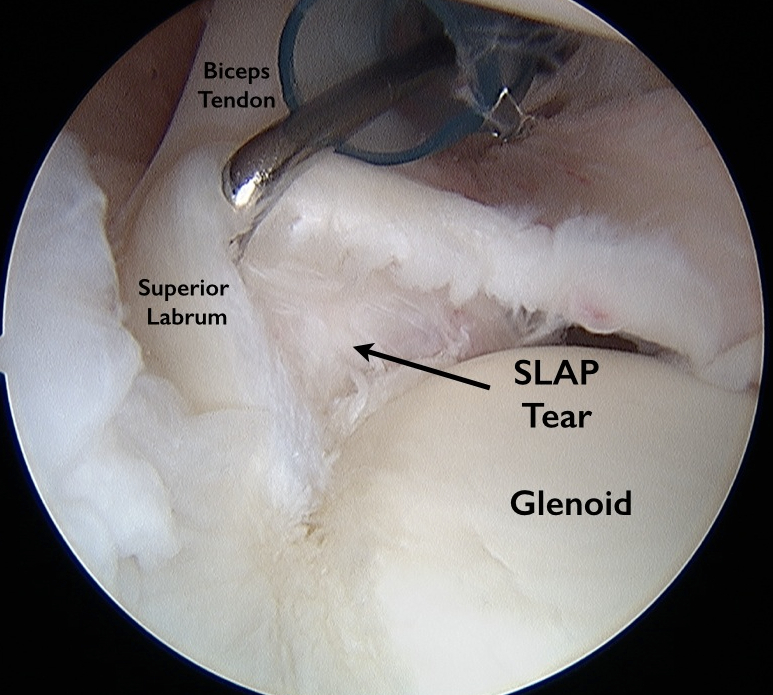 The labrum is a thick fibrous ring that surrounds the glenoid. It helps provide stability to the shoulder by deepening the socket and serving as a firm attachment point for the ligaments that connect the humerus to the glenoid. One arm of the biceps tendon (Long Head) also attaches to the shoulder labrum at its top. The regions of the labrum are described by their locations: Anterior (front), posterior (back), superior (top) and inferior (bottom). 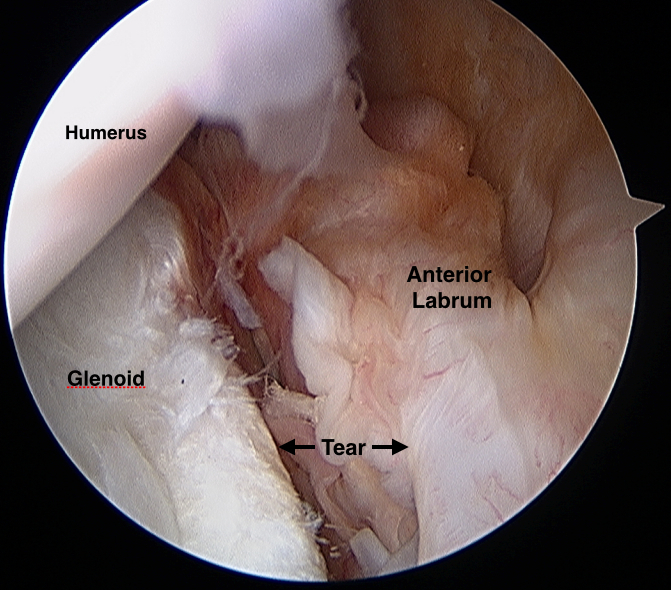 The following video shows the normal anatomy of the anterior and inferior labrum followed by a tear in this same area. The glenoid is on the bottom and the humerus is on the top. Labral tears of the shoulder can occur in any location along the labrum. They can also occur in adjacent regions as well. Usually the tear will consist of a segment having been “pulled off” its attachment on the glenoid. Once torn, the labrum can remain in its normal location (non- displaced) and simply be unattached to the glenoid or it can be unattached and have moved to another location (displaced). Tears can also result in cracks in the labrum, loose flaps or more complex patterns with multiple different characteristics. Some labral tears of the shoulder are “degenerative”. These tears may or may not be symptomatic. They are frequently found accidentally on an MRI or during surgery performed for another problem. Labral tears of the shoulder can occur from a number of causes. Often they are a source of shoulder pain and/or instability. Frequently, these tears result from an athletic injury. Common acute athletic injuries that may cause labral tears are shoulder dislocations or subluxations in which the shoulder feels as though it has “come out of the joint”. In the following video, view a wrestler (in gray singlet) dislocating his left shoulder (@ 1:19 secs). Other athletic activities that may result in labral tears are throwing, pitching or other repetitive overhead activities such as playing volleyball or swimming. Additional common causes of labral tears of the shoulder are falls onto a hand, forearm or elbow, motor vehicle accidents or a sudden “pull” of the shoulder that may occur, for instance, while walking a dog or hanging from an arm while falling. Finally, degenerative labral tears occur due to aging of the labrum and shoulder without an acute injury. As the labrum ages, its blood supply diminishes and it starts to accumulate damage that ultimately may result in a tear. Fortunately, degenerative tears are often not symptomatic and therefore frequently do not require any treatment, particularly surgery.